Howtomakeadollar is very pleased to announce that every state in our great United States of America loves our blog! Howtomakeadollar has been visited by someone in every state! Thanks for visiting. It only took us 9 months... but it finally happened. Montana took the longest, so thanks to everyone from Montana for checking us out! 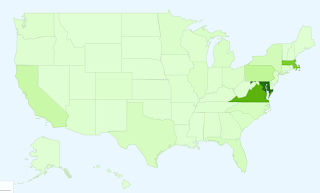 wow - and to think I was proud when I got 11 states participating in meaningandsignificance.blogspot.com. That just goes to show you how important it is to make a dollar in today's economy. could you explain the color variations on this map?